Preheat oven to 375° F. Line a large cookie sheet with cooking parchment paper. Separate Pillsbury™ Crescent Dough into 8 triangles. Spread about a tablespoon of marshmallow fluff onto each triangle. Drizzle just a little caramel sauce over marshmallow creme. Don’t drizzle too much, or it will all leak out in the oven! If desired, sprinkle on a few mini chocolate chips. Roll crescents up and place on prepared cookie sheet. Bake 10 to 12 minutes or until golden brown. Cool 5 minutes on cookie sheet. 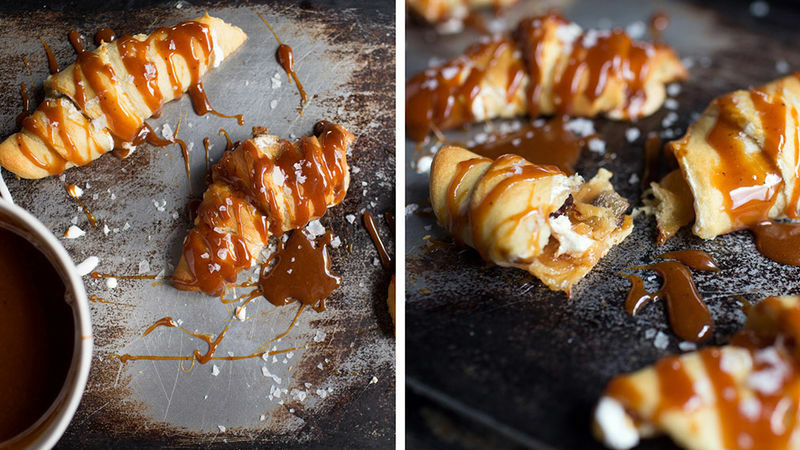 Drizzle crescents with caramel sauce and then sprinkle with flaky sea salt. Serve warm. If you don’t have marshmallow creme on hand, try using mini marshmallows. Just add about a heaping tablespoon per triangle and then follow the directions above. For a flavor swap, try making these with Nutella™ instead of the marshmallow creme. To be completely honest, I have no words. They’re the ultimate cozy substitute for summer’s bygone delight, the s’more. I’m so excited to be serving them up for the holidays this year. They’re the perfect easy sweet treat to put everyone in that relaxed holiday sprit! You only need four simple ingredients to make these, and that includes the flaky sea salt—which yes, is a MUST! To start, grab your can of crescent rolls and break it open. Place the 8 triangles on a parchment-lined cookie sheet and spread with about 1 tablespoon marshmallow fluff. Drizzle the marshmallow fluff with just a little caramel. Make sure you don’t over stuff these crescents—if you do, your fillings will all leak out. Still delicious, but just not as pretty! Okay, now roll the crescents up and space them out on the baking sheet. Bake for 10-12 minutes or until the crescents are golden brown. To serve, drizzle the crescents with the remaining 1/3 cup caramel sauce and sprinkle each with a little flaky sea salt. I love these best served warm, so grab a glass of COLD milk and cozy up by the fire! PS. adding in a few mini chocolate chips never hurt anyone…shhh, I won’t tell!